Another Saturday in the AFL and another great four game slate to look forward to! 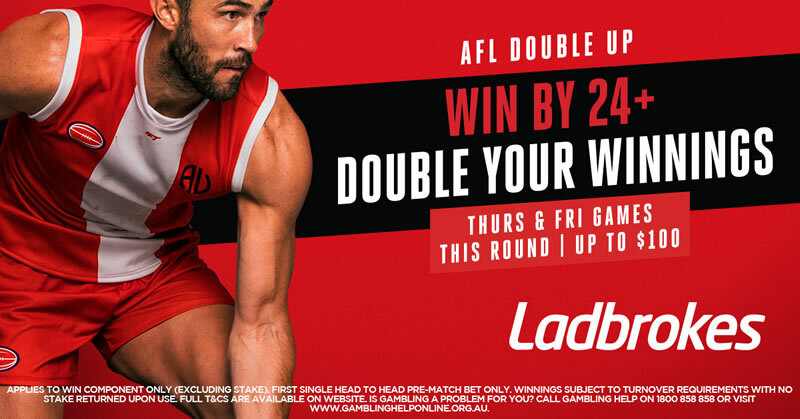 The days action is headlined by a massive Grand Final rematch at 7.25pm at the MCG but we take a look at all four games and give our betting tips below! We'll be focusing on the Saturday games in this preview, but if you want previews and tips for the rest of the Round 3 action, make sure you head to our AFL Tips Page. Both the Blues and the Swans will be hunting their first win of the season when they meet at Marvel Stadium on Saturday afternoon. The Blues have had a tough run to open the season with games against Richmond and Port Adelaide and should fancy their chances against a Swans team that has been pretty underwhelming. Patrick Cripps was dominant once again in the loss to the Power, racking up 32 touches and seven tackles while forward recruit Mitch McGovern booted two goals. The Swans were throroughly outplayed by the Crows in Sydney in Round 2. While the final margin was just 26 points, the Crows never really looked like losing as they dominated the key stats all night. Josh Kennedy was the shining light for the Swans, accumulating 36 touches while Lance Franklin kicked three goals. Tough match to call here. The Swans start as 12.5 point favourites which could be a little high given how they have played to open the season. The Blues have been super competitive in their two matches but fall away for 20-30 minutes at a time. We think the Swans find their first win of the season in a close match. The Giants were dominant over the Bombers in Round 1, claiming a 72 point win at Giants Stadium. They had a tough road trip to Perth in Round 2 to take on the Eagles and went down by 52 points as they kicked just seven goals on the day. Injuries continue to be a concern for the Giants as Toby Greene missed the trip to Perth with general soreness and is likely to be out once again this week, however, star midfielder Josh Kelly is set to return this weekend. Another side that has been ravaged by injuries to start the season is Richmond. The Tigers lost arguably their most important player in Alex Rance for the season in Round 1 as the defender went down with an ACL injury. The Tigers will also be without premiership players Shaun Grigg, Dylan Grimes, Bachar Houli and Jack Riewoldt for this weekend's game. The Tigers get Josh Caddy back this weekend but it's hard to look past their massive injury list. They looked sluggish against the Pies last weekend as they were beaten by 44 points and really struggled to find an avenue to goal. We think the Giants control the tempo in the midfield much like the Magpies did and win at home. The Lions have been one of the revelations of the 2019 season so far as they trounced the Eagles in Brisbane in Round 1 before travelling to Melbourne to take down the Kangaroos on the weekend. They sit second on the ladder and have another great chance for a win this weekend as they return to Brisbane for another home game. . The Power are another 2-0 team but their form might be a little deceiving as they beat a lacklustre Melbourne team by just 26 points in Round 1 and just managed to get over the Blues in Round 2 by 16 points. This weekend will be their biggest test as they come up against the red hot Lions but the additions of Ollie Wines from injury could be a big boost. The Lions look like one of the form sides in the competition at the moment and should be up and about as they return to The Gabba. They haven't beaten the Power since 2015 but got within just five points in Port Adelaide in Round 3 last season. We think this is another close match with the Lions prevailing. The Pies will play their third match in a row at the MCG to start the season when they face off against the Eagles in a massive Grand Final rematch on Saturday night. Collingwood were outplayed by Geelong in damp conditions in Round 1 but bounced back to decimate the Tigers in Round 2. The Pies midfield controlled every aspect of the game against the Tigers as they racked 167 more disposals and 94 more marks than their opponents. The Eagles also bounced back after a Round 1 loss to the Lions as they defeated the Giants by 52 points at Optus Stadium. Jack Darling was fantastic in the win, booting four goals while Grand Final heros Dom Sheed and Luke Shuey both dominated in the midfield. The Pies start as 15.5 point favourites at the MCG, a line that would prbably be almost reversed if the game was in Perth. The Eagles showed that they are capable of winning at the MCG last season but the Pies look like a different beast after their win over the Tigers. The midfield could stake a claim to being one of the best to ever walk out in an AFL game and we think they get the job done here.